Webmasters note: We have shamelessly appropriated text & pictures from http://www.worldofscoutingmuseum.org/TheOriginsOfScouting.html which is a fantastic site & resource discovering how Scouting developed beyond B.P. I do recommend you open the link & read up on the history fully, it's one of the best i've come across, & hope the world of scouting museum understands why we were so keen to use their material & see fit to share their excellent work with us! Before founding the Scouting movement, Robert Baden-Powell was best known for his military exploits. His full name was a bit of a mouthful ..which is why folk probably referred to him as "B-P"
In 1899, the then "Colonel" Baden-Powell and about 1,500 British soldiers and 40 young cadets came up against 7,500 Boers at the town of Mafeking, South Africa. They held fast under seige for 217 days until reinforcements arrived. All of England proclaimed him "The Hero of Mafeking" and he soon became world renowned. This fame would later help propel the fledgling Scouting movement. The Scout movement was founded by Robert Baden-Powell in 1908. Baden-Powell, popularly known by Scouts as “B-P”, was born in London on 22nd February 1857. His birthday is remembered as Founder’s Day. He had a distinguished military career in the British army, becoming the youngest ever Major-General before his retirement in 1910. Much of his service was with the cavalry regiments in India and South Africa, but he was stationed in Ireland for short periods in barracks at Ballincollig (Cork), the Curragh, Dundalk, Belfast and Dublin. B-P himself excelled at “scouting” – the skill of military reconnaissance in enemy territory - using his stalking, camouflage, disguise, mapping and survival skills. He published several training manuals, including Aids to Scouting, based on his techniques. These involved more scope for individual initiative, work in small teams and recognition badges to reward achievement. B-P was best known for the defence of Mafeking in a siege during the Boer War 1899/1900. The cadets of Mafeking (young boys of the town) proved invaluable during the tense seige where they served as look-outs, delivered messages between the troops, and aided hospital orderlies. They demonstrated that boys, with proper training and when given opportunities to demonstrate themselves, could make great contributions both individually and in small groups. This left a strong impression on Baden-Powell and from this experience the Patrol System in Scouting would grow. Baden-Powell became garrison commander during the Siege of Mafeking, which lasted 217 days. Although greatly outnumbered, the garrison held out until relieved, in part thanks to cunning deceptions devised by Baden-Powell. Fake minefields were planted and his soldiers pretended to avoid non-existent barbed wire while moving between trenches. Baden-Powell did most of the reconnaissance work himself. In one instance noting that the Boers had not removed the rail line, Baden-Powell loaded an armoured locomotive with sharpshooters and successfully sent it down the rails into the heart of the Boer encampment and back again. The proofs of Baden-Powell's military handbook, Aids To Scouting For NCOs And Men, were smuggled out of Mafeking and published in England in 1899. 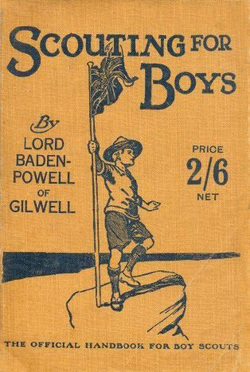 When Major-General Baden-Powell returned to England at the end of the war, he was surprised to find that his handbook was being used in clubs and schools to train boys. Influenced by the ideas of Ernest Thompson Seton and Daniel Carter Beard, Baden-Powell dropped the military aspects and re-wrote his book. Brownsea island (dorset) camp ...where it all started. B-P held an experimental two-week camp for 20 boys on Brownsea Island, (Poole Harbour) on the English south coast in August 1907. He tested his ideas with a programme of Scouting activities - camping skills, observation, nature, woodcraft, life-saving, first aid, games & contests – this was an outstanding success. They set up camp on the remotest point of the island in order to really test themselves & clearly the boys all enjoyed themselves, lighting fires, camping, cooking, learning to track, swimming climbing, learning group skills, fishing, swimming, climbing, hiking, woodcraft, navigation, team & individual games,... much like beavers, cubs & scouts of today! This successful endeavour was followed by the publication of Baden-Powell's best selling "Scouting For Boys" the following year. Troops quickly formed all over The U.K. ..it wasn't too long before the idea spread to Canada then to the United States & beyond! "Scouting for Boys", first published as six fortnightly part-works in January 1908. Boys snapped these up from newsagents all over Britain and Ireland and formed Scout Patrols wherever they could find a meeting place. In response to requests from girls to join, B-P established a sister organisation, the Girl Guides, in 1910. Scout Troops were open to boys aged 11-17, but demand led to the addition of Wolf Cubs (8–11) in 1916, and Rover Scouts for over 17s in 1919. B-P was well ahead of his time in the late Victorian and Edwardian era's when young people were “seen and not heard”. Many of his novel methods for informal education have since been taken up by mainstream schooling, but the spirit, fun and friendship of Scouting still gives it a distinctive place in the development of young people. B-P was later created Lord Baden-Powell of Gilwell. His gravestone bears a circle with a dot in the centre "ʘ", which is the trail sign for "Going home", or "I have gone home"
Kenya has declared Baden-Powell's grave a national monument. A fantastic resource, including the list of planned events for B-P's Brownsea island camp.. Please get your parents / carers to watch these for you first to make sure that they don't mind you watching this!